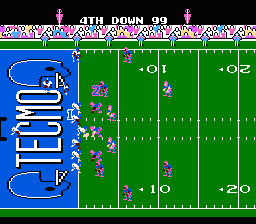 NES Tecmo Super Bowl (USA) in 11:05.02 by adelikat. This movie doesn't aim to run up the score. Instead, it plays an entertaining game of American football by keeping the score close for drama and by utilizing a variety of wild plays with interceptions, fumbles, impossibly long passes, etc. Thus, the movie manipulates luck often. In addition, the author exploits a number of bizarre bugs, such as CPU players tackling their own teammate, and a very unorthodox final play. True tecmobowlers will enjoy the team choice and final score.